You might have read the comics about the cowboy Lucky Luke in the Far West. If you did, you will certainly remember the coaches, the nature, the small wooden towns and maybe the trains that traversed the land on single tracks. In some comics they were laying train tracks and building massive wooden bridges in the hard, rough and unforgiving landscape. 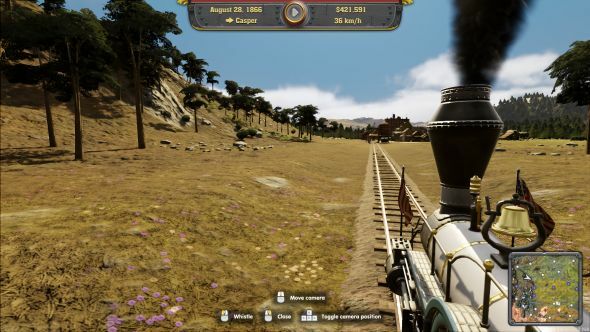 This game gives you the opportunity to experience starting a train transport business from scratch. The goal? Have all people and goods traverse the country on your tracks in your trains, stopping in your stations and work and get processed in your factories. It’s the year of our lord 1830 and you stand in the grass of the endless plains of central USA. People move around in coaches or on foot, and moving goods and mail around is slow and costs a lot of manpower. 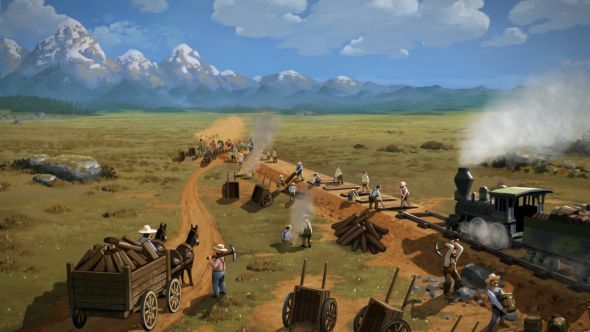 A steam machine has been invented however, and you possess the capital to pioneer in one of the most advantageous business at that time: connecting cities, towns and villages with each other and with resource producers. You start off small by choosing where you start your imperium. As you build your first line between two places, revenue starts rolling in allowing you to connect more places. The towns you help develop by providing goods grow and as they grow, their needs change for more exclusive and developed goods. You can buy business, landmarks and universities in the towns and provide the raw material they need, increasing revenue even more. As time passes, so does technology and knowhow. You research better trains, services and methods and use them in the field. 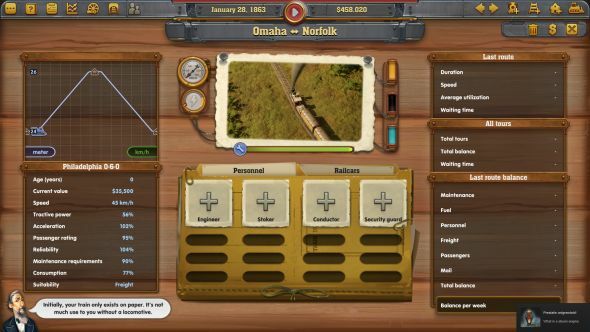 Personal can be hired to staff your trains and special wagons are added to the train serving specific needs and optimizations. You are not alone however, competitors are also sensing the many opportunities and start developing railways of their own. You can buy their shares, sabotage them and even take them over, becoming the sole railway emperor in the end – your ultimate goal. Of course you don’t have to do this all alone. You are helped by a benefactor, giving a specific bonus to a field. The benefactor also tells you what you should know and how you should proceed, in the form of tutorials and incremental tasks. Plenty of actions have a tutorial video in a tooltip at the right location, visually explaining how to do something. Plain and simple, the game looks really good. The landscape is beautiful and realistic, and very divers, representing the real areas of the United States. The details are amazing and you can zoom quite far to have a better look on the many small trees, rocks and houses spread around the maps. You can zoom quite far on the map and it is fascinating to see the trains move around bridges and bends. 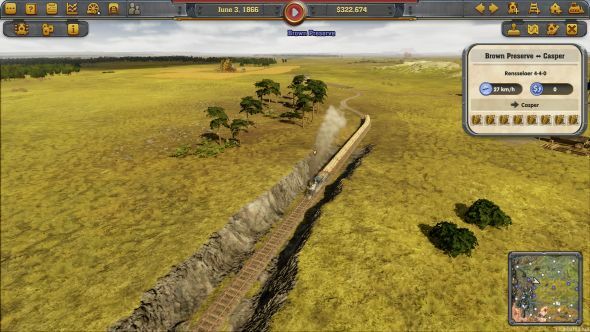 You even can ‘ride along’ with the train, in which you can look around from the position of the train driver in beautiful 3D. Sadly there is no ‘eagle view’, it would have been fantastic to be able to see the whole train in 3D. When you arrive in a station while in 3D view, you can see people and carriages move around in the city, and they are rendered in 3D as well. You can play for hours without even noticing this, so it’s a very nice gesture to have worked into this and to include it into the game. The menus could have been done better. While most menus are clear and have a nice interface, there are just to many steps to create something simple and frequent as creating a new train route. You have to create a line with all stops you want to include in one menu, but then buy a locomotive in another, then choose carriages in another, choose the staff in even another one and then confirm again. Especially the staff window is very limited, it’s just unclear which staff members are already taken and which not and you don’t get any message that the person is already taken as well (and of course recruiting a new member is in another menu altogether). Other menus are hidden behind other unrelated ones. The main menu does looks good, the artwork in the loading screens is amazing, and the western style themed layout is really well done. Sound is on point as well. There are nice cowboy themed background tracks playing throughout the game. Of course you’re expecting some train sounds in a game about trains, so when you’re in ‘ride along’ modus you may enjoy the continuous rattle of the train running over the tracks. You can even blow the whistle! Your benefactor and the different competitors can say quite a few lines as well, giving commentary on events, your progress and actions. Every person has a different personage and a different voice to go along. Together with the difference in lines they may say this makes it a nonintrusive element to the game. 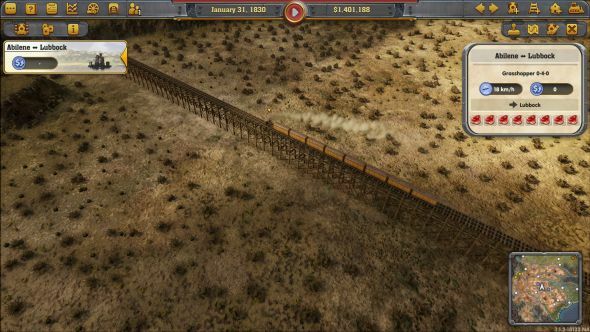 Railway Empire is best described as a train transport business simulator. The creators did their best to incorporate as many aspects of the business as they could. They’ve succeeded quite nicely, as you can utilize many aspects of running a business: from managing personnel to buying shares, prospecting new places to connect to your railway web and even the underground actions. You can make quick money by sabotaging someone’s business so their net worth decreases and consequently buy a large share cheap, that you can sell later if they increase their net worth again. Sadly, in contrast of the many options, the tutorials are rather limited and even a bit buggy. They will explain to you for what every part is used for but not how they should be used together. You need to perform some tasks as a tutorial before you can continue and it might be that your building isn’t accepted, even if it’s in the right place. This can be annoying as it requires you to do the same action again and again until it’s suddenly accepted. One thing missing is an overview of every town’s, business’ and train’s needs and revenue. This is not a problem in the beginning, but as you expand it’s really hard to keep track of all the needs, traffic density and opportunities that are present. This makes it harder to be real efficient as you will need to check every business, town and line individually. The core of the game is of course expanding your empire by building stations and expanding your railway network. You need to try to build your stations in range of as many resources as possible, or as close to the city center as possible. Laying tracks efficiently is something that requires you to check and find the best route, around mountains or cliffs. You can build through or over them, but then the cost price will increase exponentially! Lastly you need to make sure that every train has access to a maintenance depot and a supply station. We liked Railway Empire very much. 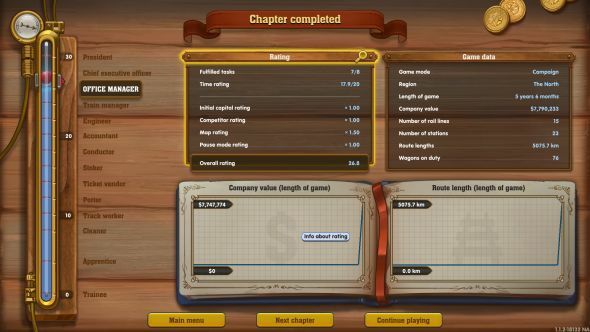 It provides you hours of gameplay if you’re into these kinds of economic games. 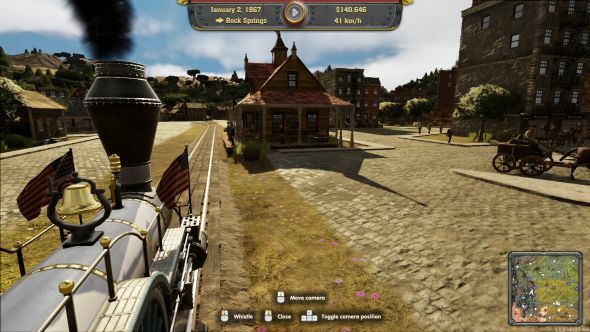 If you’re not you can still play building railroads, enjoying the original beautiful landscape of the USA and look at the many wonderful historical trains they provided. The only real issues with this game are the somewhat lacking tutorials and lack of an overview of the current state of affairs of your empire. Hopefully Gaming Mind Studios will tackle that issue in a next update or version.